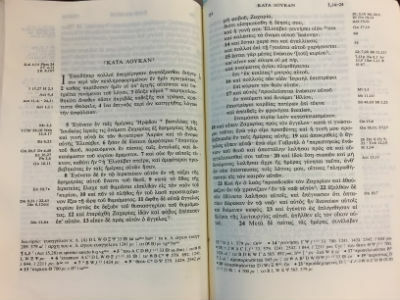 After a hiatus of several years, Warner University ministry students are tackling Greek once again, preparing themselves to study the New Testament in its original language in depth and in detail. The fall semester began with a bad case of “Greekophobia” for our ministry students—a fear of that ancient language, of how hard it would be, and what it would do to their grades. After eleven weeks, that fear has passed away! During the first century of the Roman empire, when the New Testament was written, the common language of the day, especially in the eastern Mediterranean, was Koine (common) Greek. Tradesmen in Palestine would know it, it could be heard on the streets of Corinth, and at Ephesus it would be recited in the theaters and market places. So, when it came time to write the New Testament, between 40 and 90 AD, it was natural for Paul, Peter, John, Luke, and others to write in that same Koine Greek. It is similar, but slightly different than the earlier Greek of Homer or Plato, and the later Greek of the Byzantine empire, and the modern Greek spoken in Greece today. However, in the Middle Ages, the church in western Europe turned to Latin for its liturgy, and for its Bible (the Vulgate). Part of what happened in the Protestant Reformation was a rediscovery of Greek. Luther, Calvin, and Zwingli were all men of the Greek New Testament. It was precious to them and revolutionized the church. For example, prior to Luther, people were told to “Do penance” because the Latin of Mark 1:14–15 read that way. Luther discovered that the original Greek actually said, “Repent!” In that and other ways, the rediscovery of Greek revolutionized the church and enabled it to rediscover the gospel. Today, the tools for learning Greek are phenomenal. Every preacher and minister worth his or her salt wants to learn Greek to understand what the New Testament is actually saying in the original. This is quite a change from earlier times, when a Greek New Testament was expensive and difficult to find. The reformer Zwingli copied his personal one by hand, so he could have one. In the 1700s, John Brown of Haddington was a lad in Scotland, for whom the Word of God in its original language was so precious that he taught himself Greek while herding sheep, so he would read the New Testament. He later became a famous preacher and professor of divinity. If it is true that we do not live by bread alone, but “By every word that proceeds out of the mouth of God,” as Jesus said (quoting Deuteronomy), it is Greek that gets us the very closest to those actual words. What do Warner ministry students say about their study of Greek, so they can read the New Testament in its original language? Jason Keeran has said that he has learned more about English than he ever knew before by taking Greek! 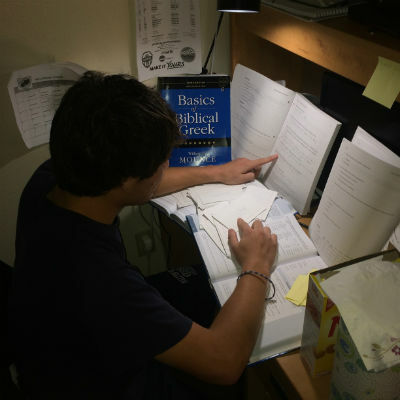 Bradley Coogan has said that studying Greek brings the New Testament to life in a whole new way, and that it has enabled him to know the God of the Bible in a greater way than ever before. He can more effectively know the true meaning of the Bible and teach it more accurately. Who will benefit? 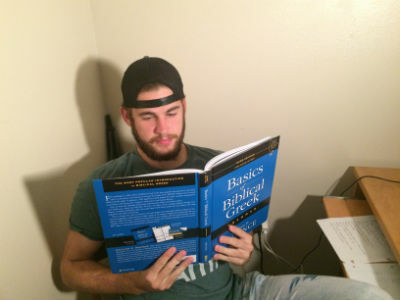 The church will be better off for these young ministry students devoting themselves to Greek, who can teach and preach the Bible with greater accuracy for many years to come, because they have invested themselves in deep study of declensions, paradigms, and vocabulary. Believers will be able to love and serve God more faithfully because of these future workers for the kingdom who accurately know the message of the New Testament. Pray for our Greek students as they seek to master this difficult ancient language, to be able to serve the Kingdom more effectively, and interpret the New Testament more accurately! For further information about the ministry program at Warner University, please contact chair Dr. Tim Dwyer at timothy.dwyer@warner.edu. Warner University, founded in 1968 by the Southeastern Association of the Church of God (Anderson, Indiana), is a co-educational, Christian university in the liberal arts tradition. The campus is located five miles south of Lake Wales Florida. The mission of Warner University is to graduate individuals who exemplify academic excellence and Christian character, who are prepared to lead and committed to serve. For more information about Warner University, visit www.warner.edu. This entry was posted in All Church of God, Colleges & Universities and tagged Bible, class, course, FL, Florida, Greek, Lake Wales, language, Scripture, study, text, Tim Dwyer, Warner University, Word of God. Bookmark the permalink.